Too Slim and the Taildraggers is an American rock band formed in 1986 in Spokane, Washington, United States. The band currently consists of Tim "Too Slim" Langford (lead vocals, guitar), Polly O'Keary (bass, vocals) and Tommy Cook (drums). Tom Brimm (bass) and John Cage (drums) were both early members of the group. To date, Too Slim and the Taildraggers have released 11 studio albums and five live albums. The Fortune Teller (2007), Free Your Mind (2009) and Shiver (2011) all charted in the Top 10 of the Billboard Top Blues Albums, peaking at numbers 9, 8 and 9 respectively. The Inland Empire Blues Society named the band "Best Blues Band" in four consecutive years, from 1995-1998, while the albums Swamp Opera and Blues for EB were also named Best Albums. 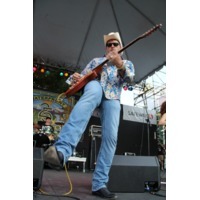 The Cascade Blues Association named them "Best Regional Band" for five consecutive years, 1995-1999. Aron Burton co-wrote a track on their 2000 album, King Size Troublemakers.